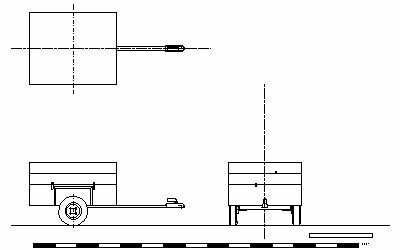 If you are a motorcyclist (or have a motorcycle-sidecar combination) in Europe, you cannot tow even the smallest teardrop trailer - for example, the maximum allowed dimensions in the UK are 1000mm (39") width and 2500mm (98") overall length from the motorcycle's back axle. These limits do not apply to trikes. Some years ago an American Gold Wing rider, Frank Mattox of Arizona, made himself a folding motorcycle camper and published his plans on the web (see below). This trailer very nearly fits within the Euro limits and provides a generous bed for one, or a 'romantic' bed for two. Frank has kindly given his permission for his design to be reproduced here as a CAD file. I hope that I will soon provide a variation of this design to fit within the UK limits. Frank's design provides a 17" (430mm) deep storage box in the lower part of the trailer and a bed approximately 84" x 42" (2130 x 860mm) folds out of the top section of the trailer, together with the framework for a tent-like cover that encloses the bed. Folded up, the trailer has dimensions 84" (2130mm) long x 40" (1020mm) wide: add about 22" (570mm) for the typical length from a Gold Wing's back axle to the towball and you get an overall length of 106" (2700mm). 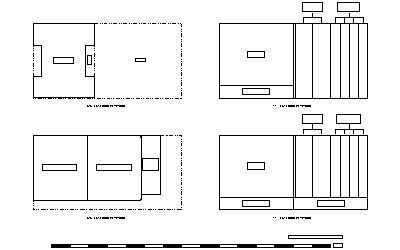 Here are the original drawings produced by Frank Mattox, the photos of his trailer and the articles he wrote describing building it.